The history of humankind's development of physics can be thought of as the history of the synthesis of ideas. Physicists keep finding that apparently disparate phenomena can be understood as different aspects of some more fundamental phenomenon. This process has continued until today all physical phenomena can be described in terms of three fundamental forces: gravity, the electroweak force, and the strong force. One of the main goals of modern physics is to find some way of combining these three forces so that all of physics can be described in terms of a single unified force. This, essentially, is the purpose of string theory. The first great synthesis of ideas in physics took place in 1666 when Issac Newton realised that the force which causes apples to fall downwards is the same as the force which maintains the planets in elliptical orbits around the Sun. The second great synthesis, which we are about to study in more detail, took place in 1830 when Michael Faraday discovered that electricity and magnetism are two aspects of the same thing, usually referred to as electromagnetism. The third great synthesis, which we shall discuss presently, took place in 1873 when James Clerk Maxwell demonstrated that light and electromagnetism are intimately related. The last (but, hopefully, not the final) great synthesis took place in 1967 when Steve Weinberg and Abdus Salam showed that the electromagnetic force and the weak nuclear force (i.e., the one which is responsible for decays) can be combined to give the electroweak force. Unfortunately, Weinberg's work lies well beyond the scope of this lecture course. where is the battery voltage, denotes the positive terminal, the negative terminal, and is an element of length along the wire. Of course, the above equation is a direct consequence of . Clearly, a voltage difference between two ends of a wire attached to a battery implies the presence of an electric field which pushes charges through the wire. This field is directed from the positive terminal of the battery to the negative terminal, and is, therefore, such as to force electrons to flow through the wire from the negative to the positive terminal. As expected, this means that a net positive current flows from the positive to the negative terminal. The fact that is a conservative field ensures that the voltage difference is independent of the path of the wire. In other words, two different wires attached to the same battery develop identical voltage differences. which immediately implies that is not a conservative field, and that . Clearly, we are going to have to modify some of our ideas regarding electric fields. where is a constant of proportionality. Thus, the changing flux of the magnetic field through the loop creates an electric field directed around the loop. This process is know as magnetic induction. for any closed surface . This ensures that the magnetic flux through a loop is a well-defined quantity. Thus, the field equation (376) actually demands that the divergence of the magnetic field be constant in time for self-consistency (this means that the flux of the magnetic field through a loop need not be a well-defined quantity, as long as its time derivative is well-defined). However, a constant non-solenoidal magnetic field can only be generated by magnetic monopoles, and magnetic monopoles do not exist (as far as we are aware). Hence, . 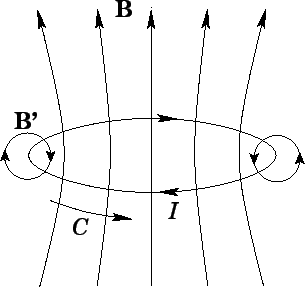 The absence of magnetic monopoles is an observational fact: it cannot be predicted by any theory. If magnetic monopoles were discovered tomorrow this would not cause physicists any problems. We know how to generalize Maxwell's equations to include both magnetic monopoles and currents of magnetic monopoles. In this generalized formalism, Maxwell's equations are completely symmetric with respect to electric and magnetic fields, and . However, an extra term (involving the current of magnetic monopoles) must be added to the right-hand side of Eq. (376) in order to make it self-consistent.